Been a busy last few days, a lot of it spent with new work for the San Diego Comic-Con at the end of July. If you're out that way I hope you'll stop by because Justin and I will have a lot of cool stuff there. I'm not sure of our booth number yet but once I get that I'll pass it along. I'm trying to juggle client work and coming up with several new pieces in time for the convention. There's a lot to do on all fronts, that and I wrecked a watercolor last night that I thought was fool-proof. Well I fooled it up alright, it's laying over in the corner now. But tonight is a new night isn't it? 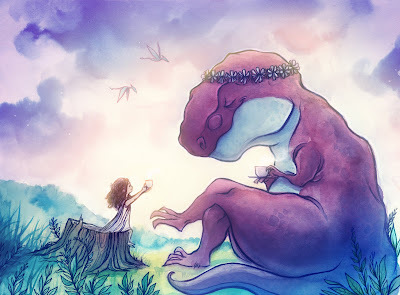 I've been excited putting together my 2009 sketchbook, Princesses, Monsters, and Things That Fly -- It's been a lot of fun pulling together work from months ago and some entirely new pieces for the book. 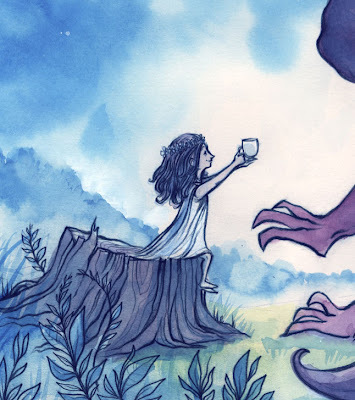 We've also got a few little surprises for SDCC this summer, I've got several new pieces in the works that I'm doing specifically for SDCC -- some original watercolors that I'm bringing to the show. 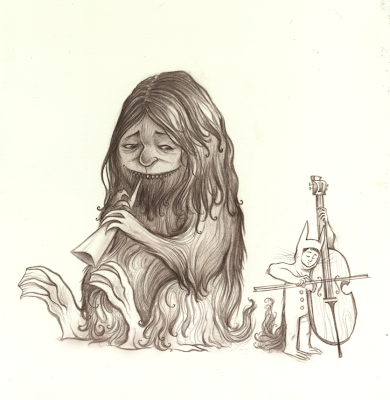 And a big thank you to those of you who have bought some of the original drawings from Grimm and Other Folk Tales! There aren't too many left but my favorite is still there. 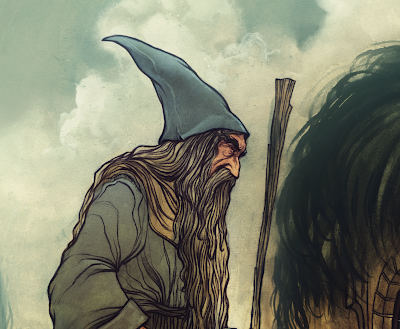 Here's a detail of Gandalf, in progress. 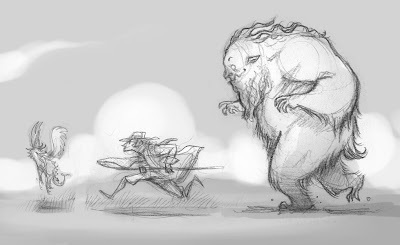 As a kid I saw the old animated Hobbit and liked a lot of it. I don't think I liked Bilbo's design quite as much, but I did really like Gandalf. I'm sure in the back of my mind that was the inspiration. What I enjoyed about the animated version was how faithful they tried to be to Tolkien's original illustrations. That's something that I wanted to be mindful of as well -- Tolkien's own illustrations for the Hobbit are beautiful and I love his line work. His drawings and watercolors owe something to Kay Nielsen, an artist I have immense respect for and have learned a great deal from. 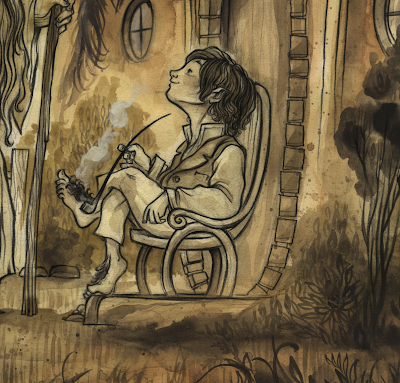 Here's a quick update from my Hobbit tribute piece -- the drawing and watercolor underpainting, a detail of Bilbo. There's no finished work yet. I'm working on this piece at night because my schedule (thankfully) is slammed during the day. Should be another couple nights at it and I'll be able to post the final piece. 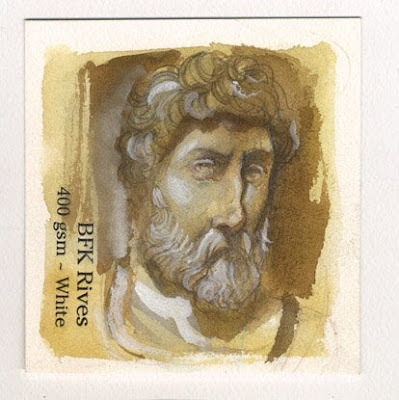 Hey everyone, just added a few new little watercolors to the store. Thanks for taking a look! 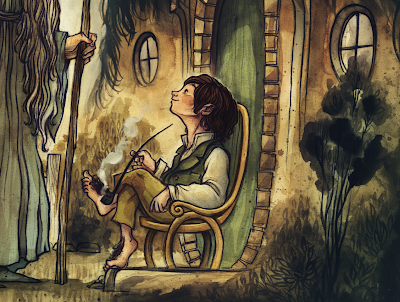 I spent the weekend working like mad on some more pieces, I got the "Good Morning" Bilbo and Gandalf tribute piece painted as well as several other new pieces drawn. Here's a photograph and the thumbnail of another new piece I'm working on. I'm not entirely certain what it's about but I think it's something to do with natural history. In other news, Zach Franzen, at long last has started a personal blog. Zach is one of my favorite people of all time and a great friend. He is one of the most brilliant writers I've ever read and is also one of the most genuinely fun people to hang out with. I took a few pictures of some different pieces I've been working on. Some are portfolio pieces, some are for my 2009 sketchbook (which I'll have available at the SDCC) some are just thumbnails at this point and some pieces are for new prints I'll have at the SDCC as well. Hey everyone, just a quick note to let you know that I've updated the etsy store with some originals : some drawings and a couple watercolors. 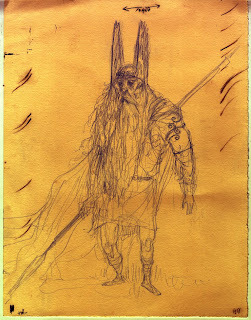 All of the drawings are from Grimm and Other Folk Tales, the supplemental drawings. Thank you for supporting Terrible Yellow Eyes. I really cannot believe all of the staggering artists involved with Terrible Yellow Eyes. The project has truly become what I had hoped for but did not imagine exactly possible. When I think about the other contributing artists involvement and the level of jaw dropping work, it's really nothing more than a testament to just how bad people love Maurice Sendak. The goal all along for Terrible Yellow Eyes was pretty straightforward; celebrate the book with pictures and invite (basically) everyone I would like to hang out and draw with to contribute. 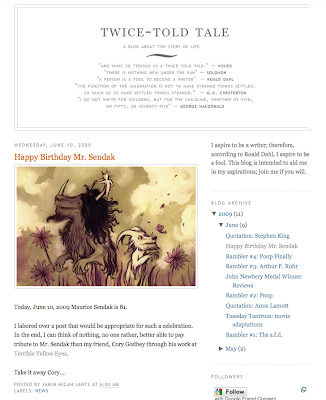 But there was always a second goal, an alternate reason just sitting there, one that I never really mentioned (except to the contributing artists) but one that was supremely important to me : Mr. Sendak's 81st birthday. When I began to seriously consider putting together something like Terrible Yellow Eyes I went to my friends over at Flight. These people are wonderful storytellers and staggering artists -- masters of visual and written communication, but not only that, they are also wonderfully kind. Kazu Kibuishi, a great friend and incredibly generous person, was the one who first invited me to contribute to Flight (Walters, Flight 6, this July!) and I'll take every chance I get to thank him again for that opportunity. But even more than that, Kazu offered a way to make my secondary goal a reality. His creative director also happened to have art directed Mr. Sendak before and knew him well and Kazu offered to pass the project on to him whenever I felt it was ready. June 10 was the day. As I understand it, the AD has indeed passed the site on. All I hope is that it might bring a smile to Mr. Sendak's face. My goal all along for TYE was to honor the book, and express my love for it in pictures because I just couldn't do it with words, no matter how hard I tried. 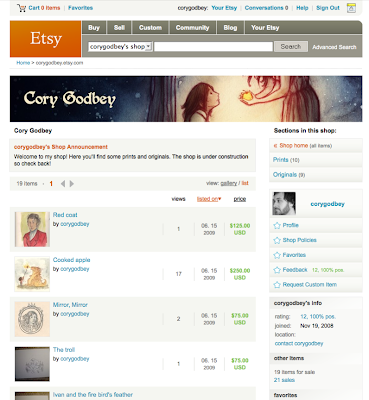 I've been humbled by the response of so many incredibly hard working, gifted artists. I think I can also say I've made a few new friends along the way. Putting together Terrible Yellow Eyes has been the fulfillment of a years long desire to do something more than just enjoy Where the Wild Things Are. Maurice Sendak has influenced me and countless others so profoundly, so completely altering us and the face of what a children's book is and what the medium can be, it seems the only thing we could have ever done was to just celebrate it. I got to meet Mr. Sendak once, briefly, in NYC a couple years ago and got to tell him thank you; now, together, we can all show him thank you. A few very cool Terrible Yellow Eyes mentions yesterday! "...They are not just "re-draws" of the book. They are true, lovingly conceived and executed continuations of the conversation." "We’ve gotten about 1,000 emails about this site since we started this adventure so it seems only fitting to post it on Maurice’s Birthday. Terrible Yellow Eyes, paintings upon paintings upon sketches, upon drawings all like the one above inspired by Wild Things." Another by my esteemed friend and fellow gardener, Jamin. His blog chronicles all sort of things I'm afraid of. Actually just the rambles. Everything else is great. 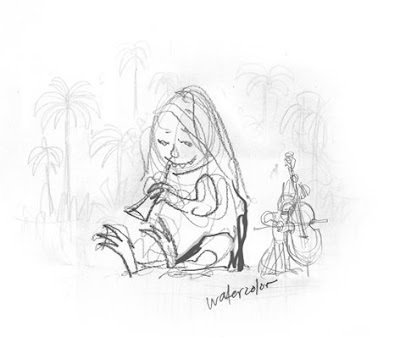 Here's a peek at the drawing for my Terrible Yellow Eyes painting tomorrow -- wait no, today. In 11 hours. 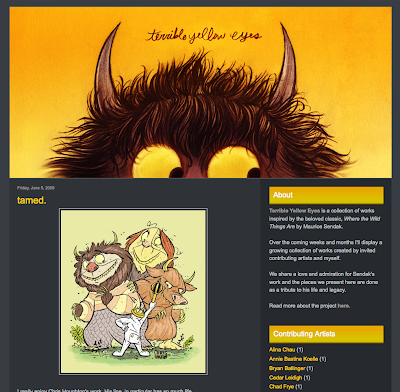 Be sure and check out TYE starting at 8 AM, every 15 minutes, a new contribution for the special Maurice Sendak birthday postings! Tomorrow is Maurice Sendak's 81st birthday. 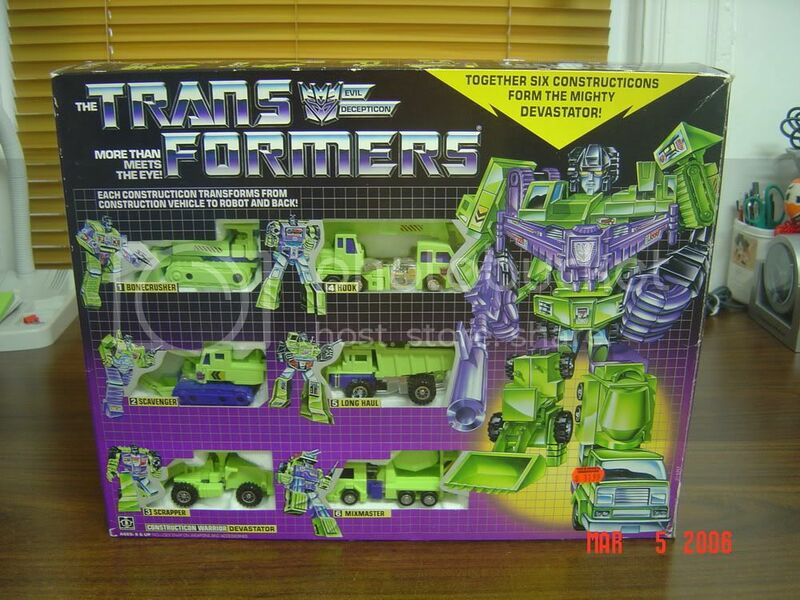 Truthfully, I've been feeling as excited for it as I remember feeling for my eighth birthday. Or something like that. But! I am very excited for it. It's the big reason for Terrible Yellow Eyes; beyond just being a place where I (and friends) can post paintings that express my (our) love of the book, it's really a giant, digital birthday card for Mr. Sendak. 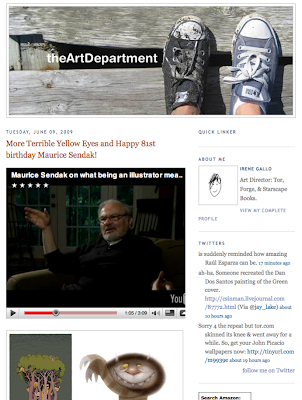 I have a friend whose Creative Director also happens to be Mr. Sendak's own art director and he's offered to pass the site along. This was some terribly exciting information for me to contain. 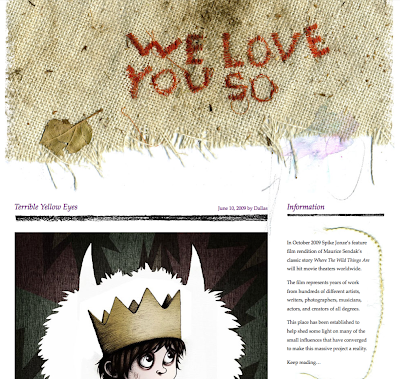 So, that all being said, tomorrow we'll have a special Sendak birthday post over on Terrible Yellow Eyes. 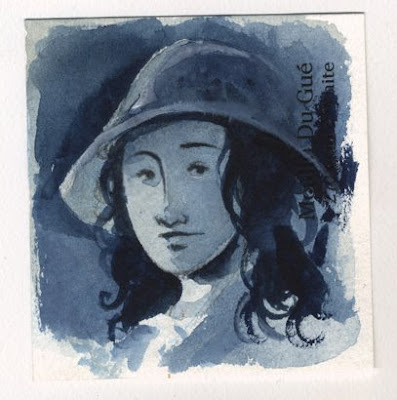 And we've got some big guns tomorrow -- I'm just ridiculously pleased to be able to post a contribution by one of my personal heroes, Peter deSeve. Well, again, so as to not abandon my blog while I focus on Terrible Yellow Eyes, I am posting the preliminary work for the new piece posted over there. Check out TYE tommorrow to see the final painting! Here's the final (pending approval) commission. I'm extremely close to being done (pending client approval) just some minor detail working left to do. This project has been very fun and I'm a little sad to see it drawing to a close. Sorry for the lack of posts this week, things have been pretty busy at work and around home. At work I'm working on a sample for an awesome and big client (but I don't think I can talk about it yet) but it's going so well, and so fun. I get to storyboard, and draw with brush and ink and re-compose those drawings into layers for animation. It's been a great experience. In home news, we finished the upstairs bathroom, or rather, Erin did and I painted a coat of paint and then played Nintendo. Terrible Yellow Eyes has been pretty consuming this week but it's been crazy rewarding. We've got the best post yet over there today, over 20 contributing artists! I hope you'll stop by and take a look. A new piece every 30 minutes until we hit 3PM and then we move to a new piece ever 15 minutes! I've been working on several other projects at home too. Preparing for Comic-Con in July is the chief project. All of the other project sort of combine to form the big operation of Comic-Con, think of "Princesses, Monsters, and Things That Fly" my sketchbook 2009, several portfolio pieces, a couple original watercolors, assembling all my prints (many from Grimm, but other favorites as well) think of all these projects like a bunch of Constructicons who come together build the Devastator of Comic-Con. I look forward to finishing and postings these. I learned a ton working on the Grimm pieces and more still doing these Where the Wild Things Are tribute pieces. I can't wait to apply these new found knowledges to Tolkien work. Here's the current state of the Kale commission. Pretty much all we have here is the final, approved drawing and the watercolor under painting. Tragically, it's not often as I would hope that I am called upon for a piece that I would be doing otherwise. This has been a terribly fun project. I've enjoyed it immensely. I should be finishing up over the coming weekend. 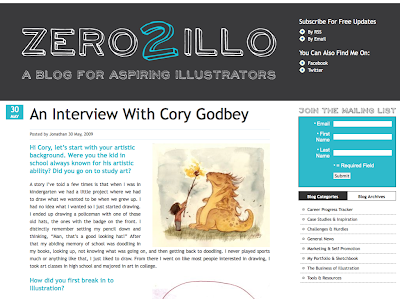 I was recently interviewed by Jon Woodward who runs Zero 2 Illo, a great blog for aspiring illustrators. Thanks Jon!